As I mentioned in the last post, another important revolutionary reform that still affects the church today is the basis for individual rights. The idea of individual or subjective rights arose from the social conceptions of feudalism. The landholders had ‘rights’ which were coextensive with their ‘dominion’. These were not only individuals. Not only barons, but monastic secular chapters, city corporations and guilds, all with their estates, asserted their several rights and looked to royal and papal government to uphold them. But the Franciscans subverted the grounding of subjective rights in property. Through their commitment to poverty, the mendicants, though owning nothing, could still eat and drink and claim the necessities of life. They grounded subjective rights on the ‘right of natural necessity’ (Bonaventure) or on a ‘right of use’ (Ockham). Thus, individual rights were claimed by a broader segment of society. Although rights were dissociated from real property, as O’Donovan points out, these subjective rights still carried proprietary overtones. Gerson invoked the term ‘dominion’ to describe this right of self-preservation, and, indeed, initiated the tradition of conceiving freedom as a property in one’s own body and its powers. 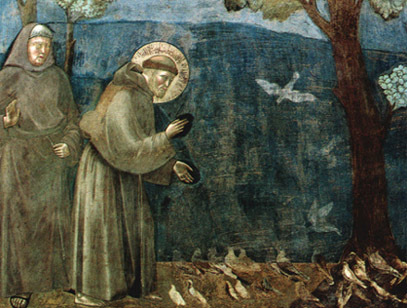 It is not difficult to see the trajectory from the Franciscans to liberation or feminist theologies. But even to these post-modern movements, Francis has a prophetic witness as Francis based his subjective right in God’s affirmation of his person, body and power. His path or relinquishment and renunciation for the sake of others challenges any claim to rights for oneself without the other.